Can A Dirty Air Filter Make a Family Sick? Home / Blog / Can A Dirty Air Filter Make a Family Sick? While residents throughout metro-Atlanta continue to battle the freezing cold temperatures leading into February, a record number of flu cases finds many staying home in an effort to get well or avoid the epidemic altogether. Yet, HVAC professionals urge homeowners—if you’re spending more time at home this season, be sure that your air filters are clean! Surprising to some, a dirty air filter can affect the health of your family. When an air filter is clean, its primary job is to filter out dust, mold spores, pollen and other airborne matter. The problem is—when an air filter is dirty or “filled up,” its ability to filter these particles decreases dramatically. 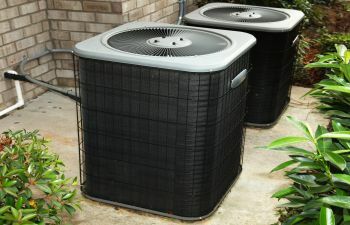 With time, pollutants essentially back up into the ductwork, which means that they are free to blow throughout the home. Inhaling these pollutants can exacerbate symptoms associated with a cold or respiratory infection, not to mention flu. For individuals with asthma, these particles can lead to an asthma attack. Not only can pollutants in the home contribute to respiratory conditions and/or illnesses, they can cause others to develop. For instance, suppose the remnants from a dirty air filter have contributed to higher measurements of mold in the air of a home. When inhaled at these levels, individuals are at risk for developing a mold allergy, while children are more at risk for developing asthma. As reported by The Mayo Clinic, a mold allergy can cause cold-like symptoms such as cough, runny nose, sneezing, watery eyes and itchiness. While a dirty air filter is sure to degrade the air quality of a home, it also leads to an over-worked system and possible breakdown. Unfortunately, by the time homeowners realize what’s happening, repair costs are high, and some units may require full replacement. Family owned and operated, ClimateSmith, LLC continues to be a trusted name for top quality heating and cooling services throughout Alpharetta and surrounding communities. While we may not be able to help you dodge the flu this year, we can certainly make sure that the air quality is your home is clean and healthy. Call the trained HVAC technicians at ClimateSmith, LLC today.